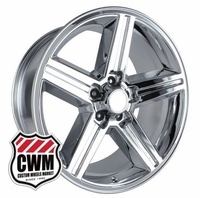 Chevy Iroc Z replica wheels on Sale ! These excellent quality Iroc Z rims come in the following sizes: 16x8", 18x8" and 20x8"
Our Iroc replica wheels with 5x4.75" lug pattern and 0 offset (4.50" backspace) bolt on directly on all stock 1967-1992 Chevy Camaro and also on other Chevy, Buick, Pontiac and Oldsmobile Rwd Cars with 5x4.75" bolt pattern and low backspacing. No wheel spacers or car modifications are required. Free Shipping on all of our Chevy Iroc Z style rims !